Meters must have a clear and unrestricted path for access at all times. Meters must remain accessible at all times. While we no longer physically read meters, we will be performing periodic safety inspections. Meters should not be located in areas which are inconvenient to enter or where privacy is desired. The meter must have a working space of 36” wide x 36” deep and located in an area with a minimum of 84” of standing head-room. New service entrance location shall be approved by the Cooperative prior to installation. 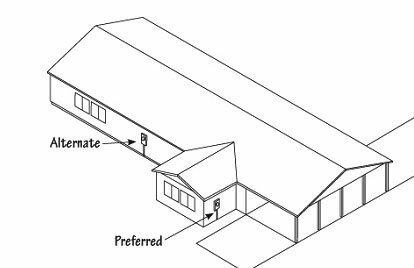 Meters to be located at alternate locations under carports, decks, breezeways, etc., shall have a clear and unrestricted path for access to the meter at all times.